The problem here may or may not be obvious especially at a quick glance. The 3' x 50' roll of weedblock is $12.97 each. The 3' x 100' roll is $27.67 each. The 100' roll has twice as much as the 50' roll. You would assume that the 100' roll would be a little bit of a discount compared per foot compared to the 50' roll or at minimum it ought to be twice the cost. You spend an extra $1.73 if you buy the 300 sq ft roll compared to buying two of the 150 sq ft rolls. I'm not going to jump to the conclusion that Home Depot is trying to scam people here. In my opinion its most likely that one of the items is priced wrong on accident. The small roll may be priced too low or the large roll may be priced too high. Its also a possibility that one of the items is a new version or an old version and the prices have changed between the new and old versions. For example maybe they ran out of the old 3 x 100 rolls which used to be priced at $23 each and replaced them with the new rolls that also happened to have a new, higher price. But at the same time they may still have the older, cheaper priced 3 x 50' rolls. A third and more unlikely possibility is that for some reason the larger rolls are more expensive to make or transport or something that makes them more expensive so they are passing along the price too us. Its also possible that Home Depot does this on purpose cause they know people aren't good at math and they make an extra $1.73 this way, but I don't want to assume that nor accuse them of it. I would have guessed that the most likely reason is a simple pricing error at my local Home Depot. 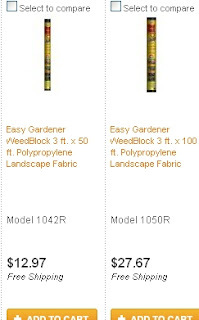 I checked the Homedepot.com website and they have the same prices there, see the picture to the right. 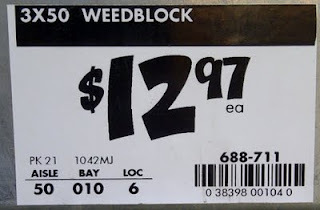 I also checked other merchants and didn't find anyone selling Weedblock for less than Home Depot. I'm not writing this just to bash on Home Depot. There is a bigger point here. You can not assume that buying a larger item will get you a price discount per unit. Generally when you buy larger items you pay less per unit. This is almost always true of consumer goods such that its often taken for granted. When I was shopping for the weedblock I almost grabbed the larger roll without even examining the price difference. Sometimes the price discounts are obvious. A half gallon of milk might cost $2.09 and a gallon is $3.19. Two half gallons would be over $4 so its easy to see that the gallon of milk is cheaper than 2 x half gallons. Sometimes the price difference isn't obvious. The 12 oz box of serial might cost $2.99 and the 18 ounce box might cost $4.29. This math isn't as obvious or easy to do in your head. The smaller box is about 25¢ per oz and the larger box is about 23.8¢. Its not a big difference but the larger box is cheaper per ounce. What if the larger box was $4.68? Then it would cost 26¢ per ounce and that might not be as obvious that its more. Whether merchants do this on purpose or just do it accidentally you need to make sure to look at unit costs rather than just assume larger quantities are a better deal. Check price tags for unit cost. 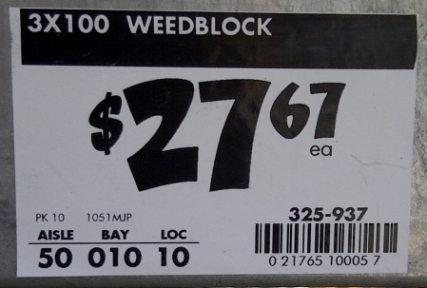 Price tags at grocery stores often have a per unit cost. If the item comes in ounces or pounds then you may see a price per ounce or price per pound. Use a calculator. If the price label has no unit cost figured for you and if the math isn't easy to do in your head, then you should use a calculator and figure the unit costs. Most cell phones have a calculator function built in so most of us have a calculator on hand.